"This foundation is established on the premise of fostering specific encompassing principles exemplified in the lifelong values of George and Cynthia Mitchell and dedicated to enhancing the quality of life by nurturing creative and scientific solutions to human and environmental problems, with integrity and compassionate respect for the individual and his natural surroundings, intolerance of prejudice, and an emphasis on the value of education and moral uplift." 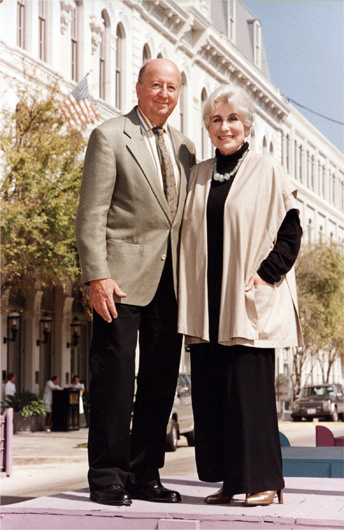 The Cynthia and George Mitchell Foundation was established on the premise of fostering principles exemplified in the lifelong values of the late Cynthia Woods Mitchell and George P. Mitchell. They were both raised as children of meager means who, throughout their lives, believed in giving back to the community that made their success possible and lending a hand to the less fortunate struggling to reach their potential. As their fortunes grew in the energy business, they shared a vision that the majority of the wealth that they had created would be dedicated to making the world a more hospitable and sustainable place. Cynthia spent a lifetime supporting the arts, educational initiatives, and humanitarian issues that focus on the disadvantaged. George had a long history of supporting the economic revitalization of his hometown of Galveston and his keen interest in science and sustainability. As the foundation has evolved, issues related to sustainability have come to represent the foundation’s true north, with the growing identification of sustainability as both a process and a goal to ensure long-term human and ecosystem well-being. The foundation also continues to earmark a percentage of funds for projects outside of its grantmaking programs, including Cook’s Branch Conservancy, the Mitchell Institute for Fundamental Physics and Astronomy, and other issues that reflect the values and vision of Cynthia and George.